It's been a while since I sat down and devoured anything zombie related. While I can't say I'm the type of fan who reads or watches all things zombies, I am ever interested in finding fresh takes on the genre. At first I didn't think ZOMBIES: A BRIEF HISTORY was going to be particularly unique, there's only so much one can do with an apocalyptic scenario after all. Somehow, it managed to maintain a steady story pace and develop some new (or at least, new to me) ideas and really tell a good story. I was particularly pleased to see the Pacific Northwest as a key setting for a lot of the story, Peru really used it well. While some elements are certainly old hat I thoroughly enjoyed this book. I couldn't put it down and actually read it from cover to cover in one sitting. If you're a fan of TWD or just love an engrossing graphic novel I would much recommend it. 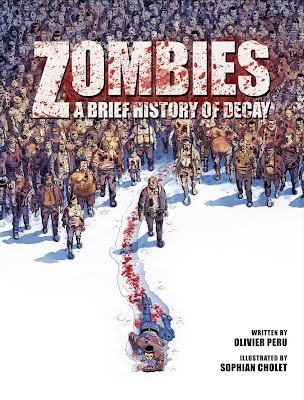 A vivid and richly illustrated graphic novel, Zombies offers an action-packed tour through an apocalyptic vision of America. Mankind is no longer at the top of the food chain. Zombies have taken their place, and nothing can stop them. Is this the end of humanity? Perhaps, but for some it is only the beginning. Six billion living corpses are all that remains of civilization. Among the few survivors is Sam Coleman, a man who owes his salvation to Smith & Wesson and a little luck. Fleeing Seattle at the onset of the zombie outbreak, he was forced to leave his daughter behind. Yet now that silence has fallen over the city, he believes that she may still be alive. And his conscience serves up a constant reminder that to be human in this grim world is to have hope—and to keep fighting.